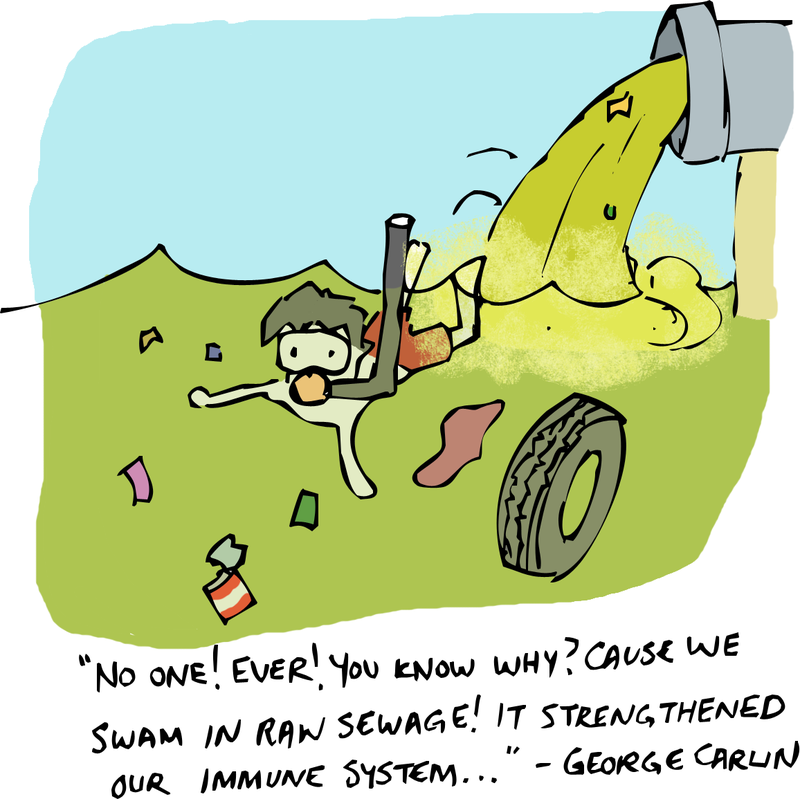 Billions of years of evolution have crafted your body into a high octane, fuel burning, disease fighting machine. There are so many processes going on in each of the quadrillion-odd cells that you are made of that scientists are only beginning to scratch the surface of basic things like nutrition and diet. However, just because your body is impressive doesn't mean that it is perfect. Occasionally, for some of us, the actions our bodies take to keep us alive can lead to intense discomfort or even death. The best example of this type of mishap is allergies. 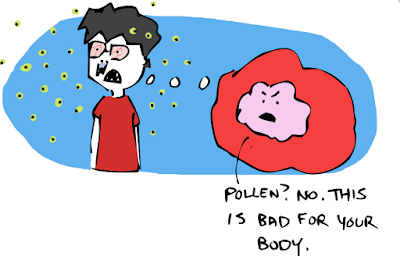 In the world of medicine allergies are referred to as an autoimmune disease, meaning that the immune system that is meant to fight of invading parasites and viruses mistakenly attacks a person’s own body. They occur in roughly 10% of people (slightly more in developed countries, but we’ll get to that) and lead to a cascade of bad times for sufferers. 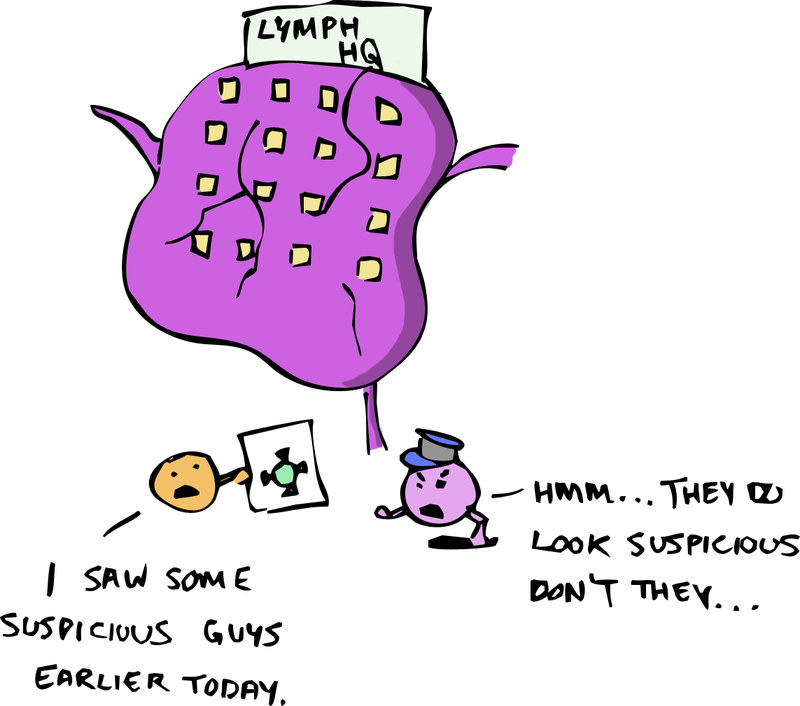 First, some new material enters the body where immune cells (the police force of the body) suspect it is up to something fishy. This is known as the "sensitizing exposure" and means that the first time an allergic person comes into contact with the thing they are allergic to, nothing happens. 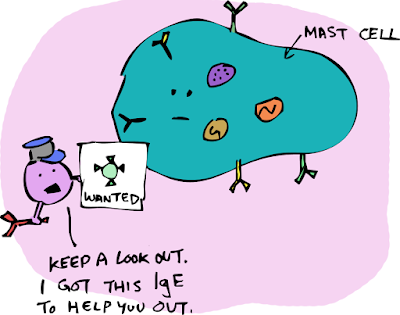 The antibodies (specifically one called immunoglobulin E – IgE for short) attach to “mast cells” throughout the body where they begin a stake-out for the suspicious material. 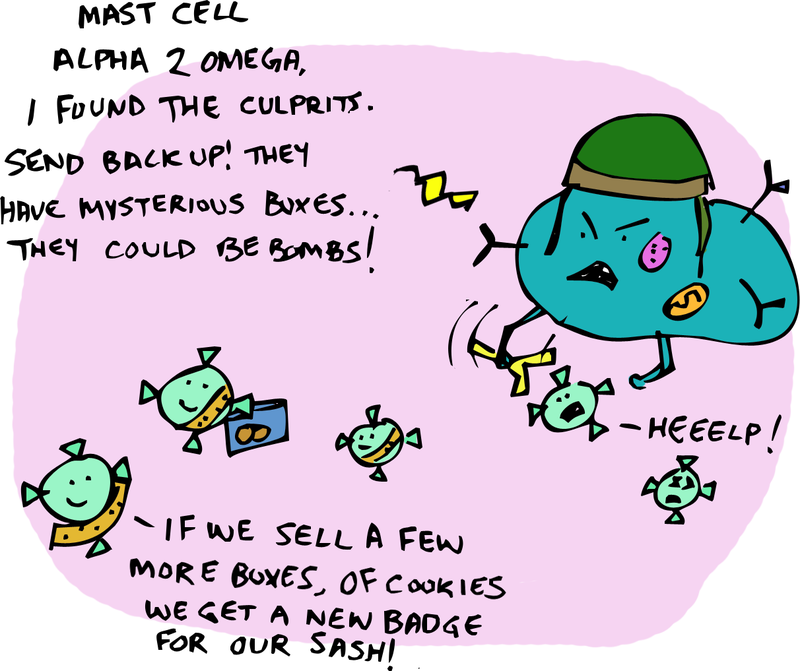 The next time the new material shows up in the body, it is attacked mercilessly by antibody-clad mast cells. This is the equivalent of activating the army, navy, special ops and coast guard against girl guides trying to cell cookies. 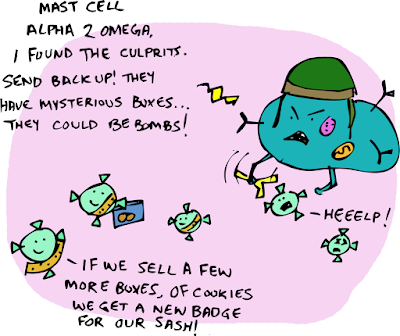 When mast cells attack their targets, the effects on the body can be pretty terrible. Chief among them are the dilation (expansion) of blood vessels and the flooding of the area between cells with fluid. Dilated blood vessels lowers blood pressure and can starve organs of the oxygen they need to function. Fluid between cells causes swelling which can make you look like a puffy, lumpy version of yourself in addition to closing your throat so you can’t breath. 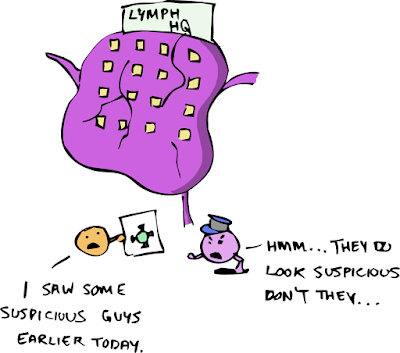 The areas of the body with the most mast cells (skin, nose, throat, intestines, etc.) tend to be hit the hardest. 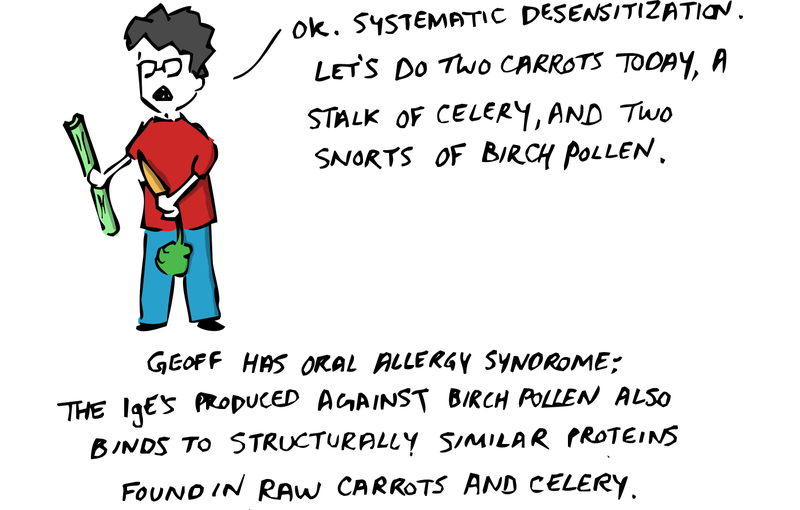 So if allergies are so clearly bad for us, why hasn’t evolution naturally selected against them? The question is actually a surprisingly hard one to answer. The truth is, no one knows; but there are two main schools of thought. 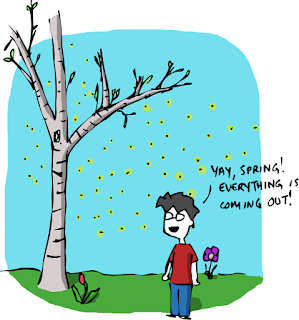 First is the idea that allergies are a reaction that benefited our bodies in the recent past. Specifically, a lot of researchers think that allergies are meant to protect us against parasitic invasions. However, since parasites are a less common component of our diets than they used to be our bodies end up overreacting and freaking out when we breath in pollen instead. 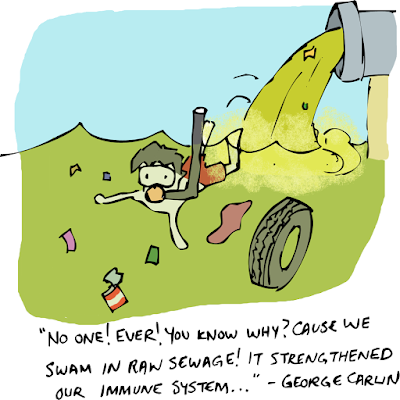 Alternatively, there is the idea that putting ourselves in a protective, germ-free bubble for the early part of our lives has compromised some children’s abilities to develop fully-functioning immune systems – the so-called Hygiene Hypothesis. Basically the body isn’t exposed to as wide a range of microbes as in was in generations past, but it still expects to be. The long wait between attacks makes your immune system paranoid it starts labeling harmless things like peanuts, pollen and shellfish as terrorists. This could explain why allergies are more common in developed countries and are on the rise in rapidly developing nations. 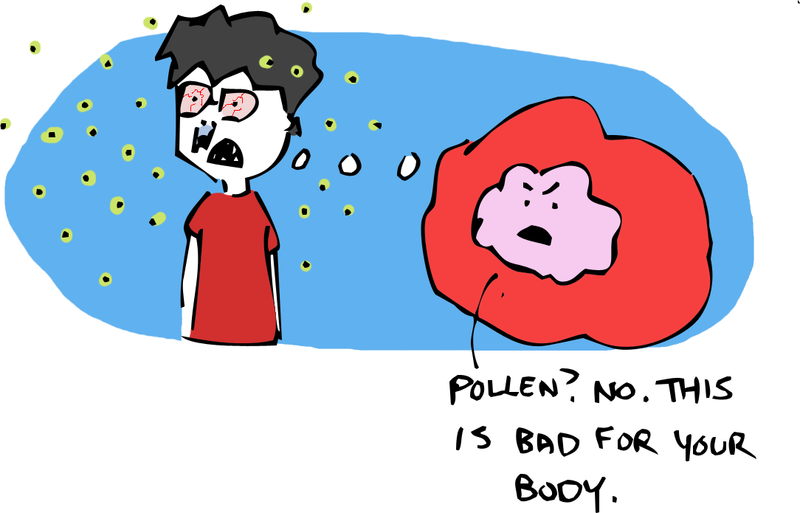 If you suffer from allergies, the best treatment is avoidance. If your allergies are severe and sneaky you might need to carry an epi-pen, which is a shot of epinephrine that constricts your blood vessels and opens your airways. Epinephrine is produced naturally in the adrenal glands and is usually not called into action unless you need to run away from a lion or something. Alternatively, if you love the thing you are allergic to (ex. your dog), you can try immunotherapy which attempts to build up a tolerance through increasingly potent injections of the protein you are allergic to. 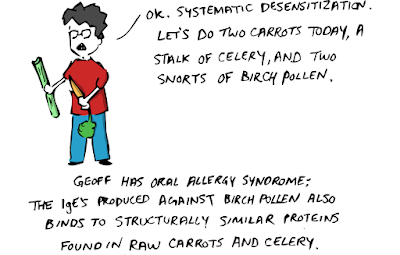 If you have a food allergy, sometimes cooking the food can destroy the protein that causes the reaction (as is the case for our illustrator with carrots), but this is not something worth experimenting with if you are hyper-sensitive. The important thing to remember is that we are still learning about allergies. 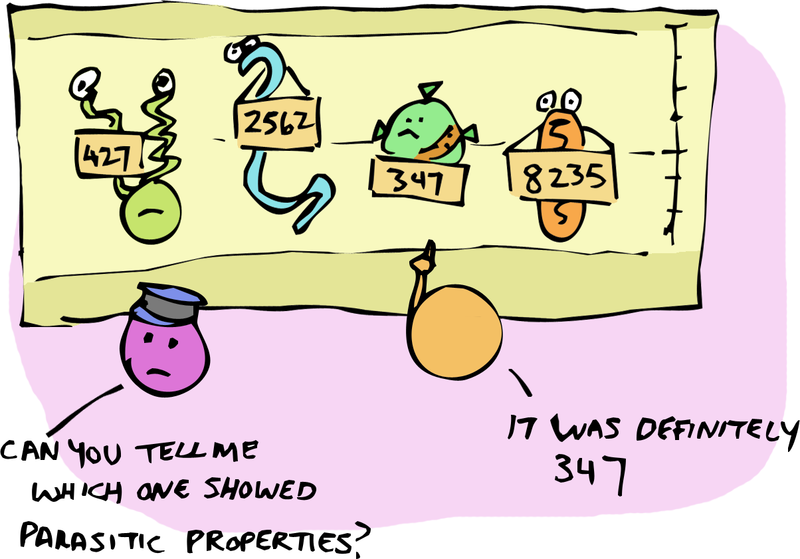 New research is leading to new discoveries, but we still don’t know everything. 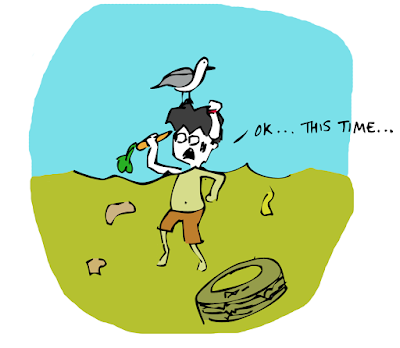 With that in mind, take things like the hygiene hypothesis with a grain of salt. In short, we don’t know enough for you to leave your baby in a tepid pool of pond scum… yet. 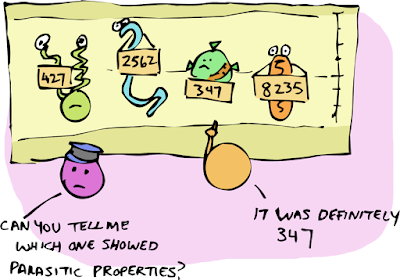 You are confusing "antigen" with the correct term "antibody". 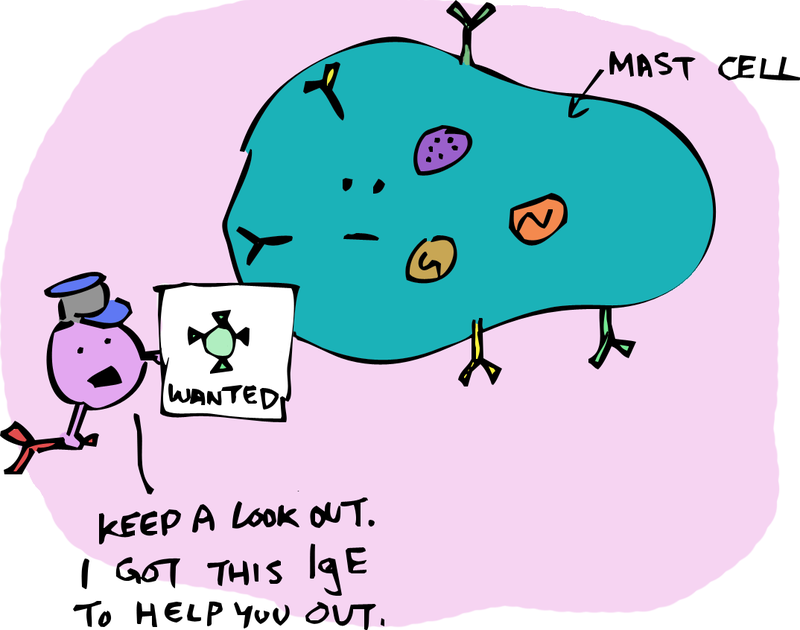 Antibodies are what are attached to mast cells, specifically the IgE isotype. Antibodies (immunoglobulins made by you) are made in response to an antigen (proteins, sugars, etc. made by something outside your body). Antibodies can specifically bind to an antigen and then lead to mounting an immune response against and/or neutralizing the foreign particle. Exactly what I was thinking. Excellent post otherwise! Thank you for the response. This was completely our bad. I have made some changes; supposedly accurate. Hopefully I have caught all instances where this occurs. Sloppy Science: Why does alcohol get you drunk?